Are you looking for a new rear spoiler for your Nissan 240SX? We have a full catalog of Nissan 240SX spoiler and rear wings to choose from. Installing a custom spoiler is one of the easiest and most affordable modifications that can be done to a 240SX. We carry a wide selection of more than 3 dozen spoilers that fit Nissan 240SX S13 and S14 models. In conclusion our selection and low pricing makes Driven By Style the perfect place to buy your 240SX spoiler. The Nissan 240SX S13 was offered in hatchback and coupe body styles. These each use their specific style spoiler and we offer many options to choose from. Take a look at the spoilers we carry for your S13 hatchback or coupe in the listings below. Weather you own a hatchback or coupe model a spoiler is great upgrade to consider. In other words this is an upgrade you simply cannot go wrong with! The Nissan 240SX S14 was only offered as as coupe body style. The spoilers we offer fit all years of S14 Nissan 240SX 1995-1998. Additionally a spoiler install can add a tremendous amount of style with minimal cost. Secondly most spoilers are a bolt on installation which makes it a very easy modification to complete. Finally we are standing by to answer any questions you may have on 240SX spoilers. Saving weight is critical when building a competition vehicle. We offer lightweight carbon fiber trunks and hatches for Nissan 240SX. By installing a Nissan 240SX trunk made of carbon fiber you can save considerable weight over the heavy stock steel components. 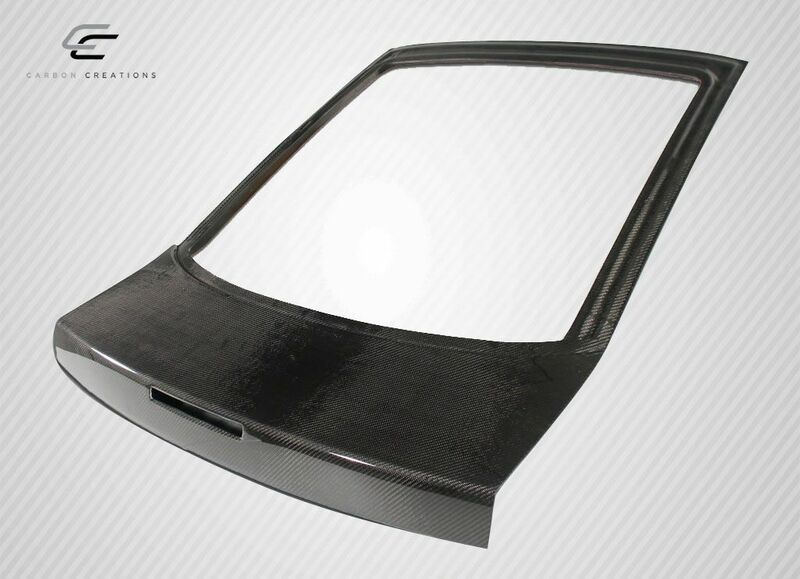 In addition to trunks we also offer carbon fiber hatches for the S13 hatchback model. Another benefit of these carbon fiber trunk lids and hatches is they look amazing! The look of carbon fiber is a favorite in the automotive customization world. A carbon fiber hatch or trunk is also the perfect compliment to a carbon fiber hood. If you have any questions about a 240SX trunk or hatch please ask. Our friendly knowledgeable staff at Driven By Style has been selling 240SX upgrades since 2009. In other words we have the experience and knowledge to answer any questions you may have. The S13 Nissan 240SX was offered in both coupe as well as hatchback models. We carry carbon fiber replacements for both models. Featured brands include VIS Racing, Seibon Carbon and Carbon Creations. For Nissan 240SX S14 owners we offer carbon fiber trunks. The OEM trunk lid weighs considerably more than the replacement carbon fiber trunks we offer. Take a look at all the carbon fiber trunks we offer in the listings below. One of the most noticeable pieces to a body kit is the side skirts. Our Nissan 240SX side skirts are available for S13 and S14 models. These aftermarket body kit side skirts lower the side profile of the vehicle by making the rocker panel appear lower to the ground. 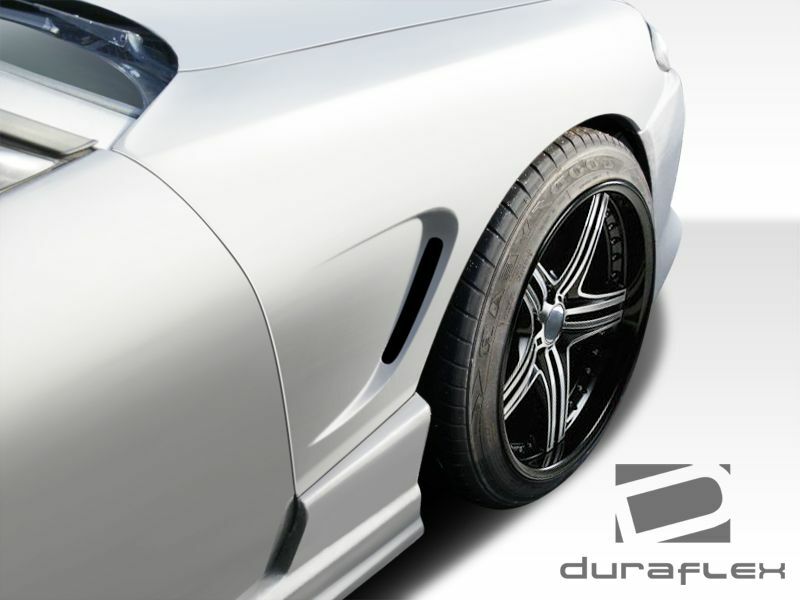 Additionally we offer Nissan 240SX sideskirts from the top brands in the industry including Duraflex, VIS Racing, AIT Racing, B-Magic, KBD Polyuethane and more. The 1989-1994 Nissan 240SX was offered in both coupe and hatchback design. We offer side skirts that fit both models. By upgrading your S13 with a set of custom side skirts it makes a strong visual impact by making the entire car appear much lower to the ground. The S14 240SX offered from 1995-1998 looks so much better as you drop the ride height! The sideskirts we offer really complete the job by lowering the side profile considerably. When you mix and match the side skirts of you preference in combination with a front and rear bumper you can create the perfect body kit for your taste. In other words your S14 is going to look great! We invite you to check out our selection of Nissan 240SX roof spoilers. By installing a Nissan 240SX roof spoiler you add styling and improve the aerodynamics profile of the vehicle. We offer roof spoiler options for both Nissan 240SX S13 coupe and hatchback models as well as 240SX S14. Additionally these roof spoilers we offer from Megan Racing are made in elegant carbon fiber. Carbon fiber is the perfect material for a roof spoiler as it means it will weigh almost nothing and does not require being painted. 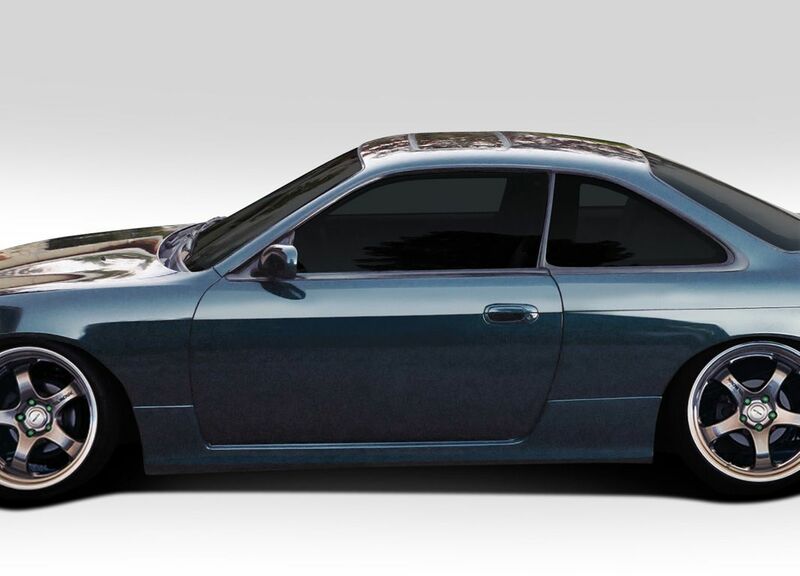 Additionally a roof spoiler is one of the easiest modifications to install on your 240SX. To install a roof spoiler no hardware is required. It simply installs with 3m double sided tape! Are you looking for a new rear bumper for your Nissan 240SX? 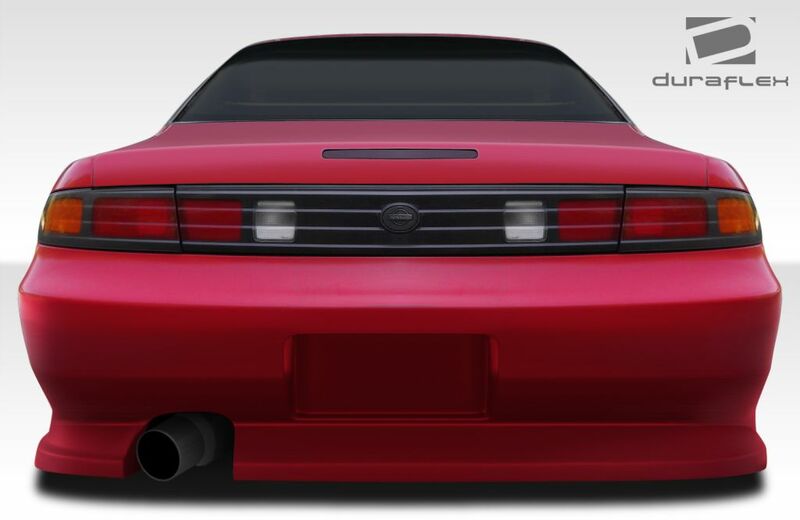 Take a look at these custom Nissan 240SX rear bumper covers we offer. These rear bumpers will give your 240SX a refresh in the style department and complete your body kit project at the same time. We offer dozens of rear bumper options for Nissan 240SX and guarantee that we will have a style you like. 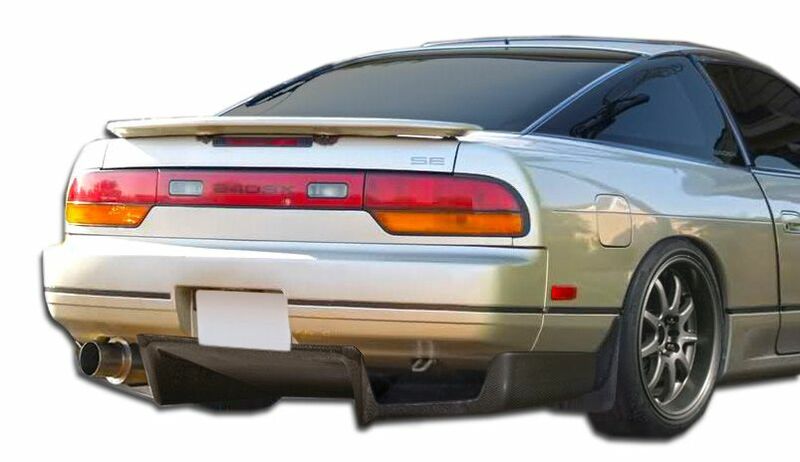 The 1989-1994 Nissan 240SX came in 2 body styles. We offer custom rear bumpers for both the 240SX coupe as well as the 240SX hatchback. Take a look at the selection of rear bumpers in the catalog below. The staff here at Driven By Style is standing by to assist you with any questions you may have. 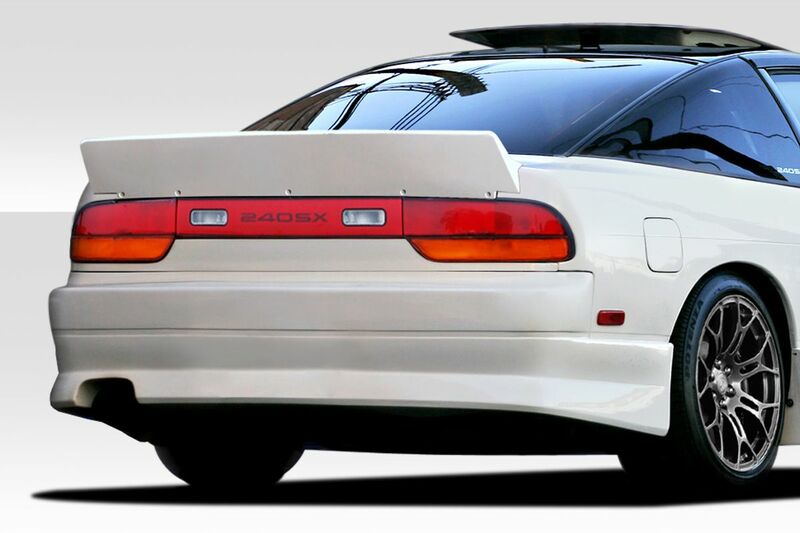 The S14 240SX uses the same rear bumper for both 1995-1996 as well as the refreshed 1997-1998 models as well. We offer a vast selection of custom rear bumpers from the top brands in the body kit industry. Take a look at all of our S14 rear bumpers in the catalog below. Do you want to update the look of your Nissan 240SX and not spend alot of money doing it? Check out our selection of Nissan 240SX front bumper lip options for S13 and S14 models. A front bumper lip also known as a lip spoiler is a great way to add custom style and also retain the OEM look of the vehicle. 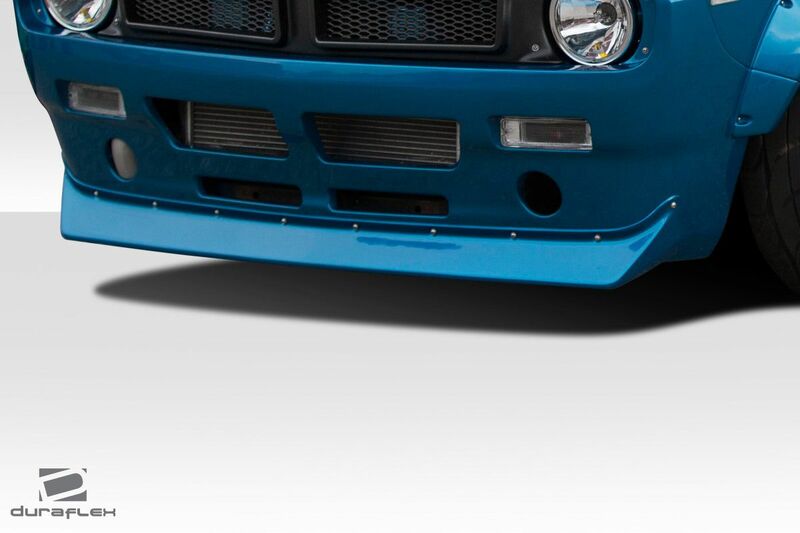 We offer front bumper lips in fiberglass, carbon fiber as well as polyurethane. Alot has changed in vehicle design since the S13 was produced from 1989-1994. Installing a front bumper lip on your 240SX S13 is a great way to update the look without getting into the expense of a full body kit. By lowering the profile of the stock bumper with an add on lip you get the benefit of a more aggressive looking stance and appearance. For Nissan 240SX S14 models we offer front bumper lips for both the 1995-1996 and 1997-1998 models. By installing a front lip on the OEM bumper you retain the factory look of the S14 but with some extra attitude! Are you looking for a rear bumper lip for your Nissan 240SX? Check out our selection of 240SX rear bumper lip add ons for S13 and S14 models. A rear bumper lip is the perfect upgrade for the customer that prefers the look of the stock bumpers but wants to add a bit of customized style. These rear bumper lips lower the body height and add aggressive styling that is sure to get noticed. We carry custom rear bumper lips for both the S13 coupe as well as the hatchback. Complete your custom body kit with a rear bumper lip that suits your personal taste. These rear bumper lips install on the OEM rear bumper using screws and double sided tape. Want to take your S14 to a new level? These custom rear bumper lips really look great when installed on the OEM rear bumper cover. Our rear bumper lips fit both 1995-1996 and 1997-1998 models. Take a look at our selection of rear bumper lips below. Are you looking to upgrade your Nissan 240SX with a custom front bumper? We invite you to check out our catalog of Nissan 240SX front bumper upgrades for S13 and S14 models. We offer a vast selection of front bumper covers from popular brands such as Duraflex, VIS Racing, KBD Polyurethane, AIT Racing, B-Magic and more. 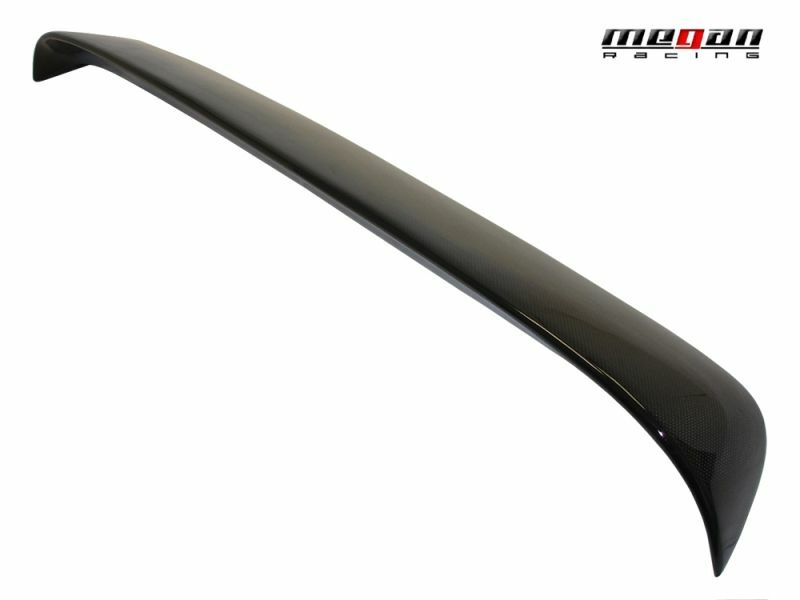 We offer dozens of front bumpers for Nissan 240SX S13 models. Although the 240SX was a great looking car off the lot it can certainly be improved upon all these years later. Our catalog of front bumpers allows you the freedom to customize your 240SX to the look you prefer most. Additionally you can mix and match our bumpers and side skirts to create a custom body kit. The S14 240SX ran from 1995-1998 with a refresh done for 1997-1998 models. We offer Nissan 240SX bumpers for both versions of S14. Take a look at the bumpers we offer in the catalog below. The staff here at Driven By Style is standing by to assist you with any questions you may have. Are you looking to add some style and cool your engine bay of your Nissan 240SX? 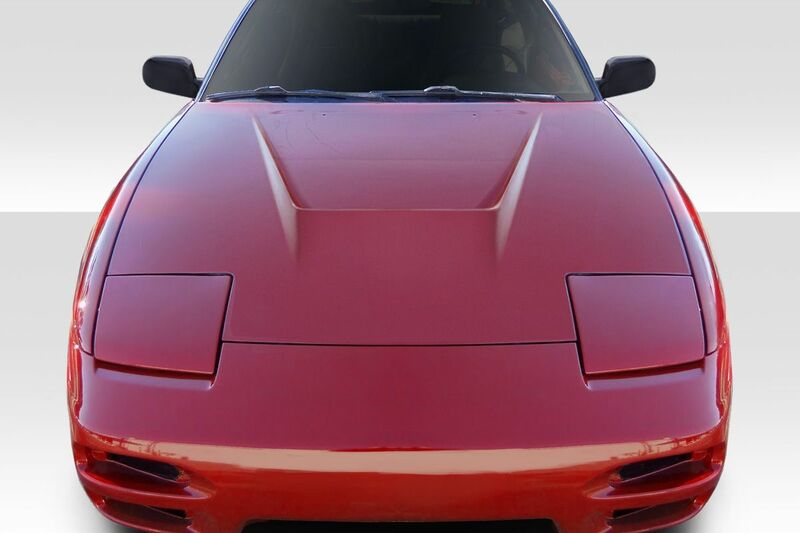 Check out these vented fiberglass hoods we offer for Nissan 240SX S13 and S14. A 240SX fiberglass hood has 2 primary functions in most instances. The main reason most owners will install a custom hood because they like the custom styling. There is another benefit you get with a custom fiberglass hood though. For example a 240SX fiberglass hood weighs considerably less than an OEM steel hood. This aids in performance by reducing weight over the stock hood. However the performance benefits are not only in weight reduction. These vented fiberglass hoods also assist in cooling the engine by by allowing cool air in and expelling the hot air. Are you shopping for a new fender for your Nissan 240SX? There are many reasons someone would replace the front fenders on their 240SX. Our Nissan 240SX fenders can be installed for cosmetic reasons or simply to replace a damaged oem fender. Some fenders we offer also adds additional wheel clearance so that you can install a more aggressive wheel and tire combination. At Driven By Style LLC we offer dozens of styles for Nissan 240SX S13 and S14 models. Browse our catalog at the bottom of the page and let us know if you have any questions. As with any performance vehicle one of the most desirable traits is wheel clearance. 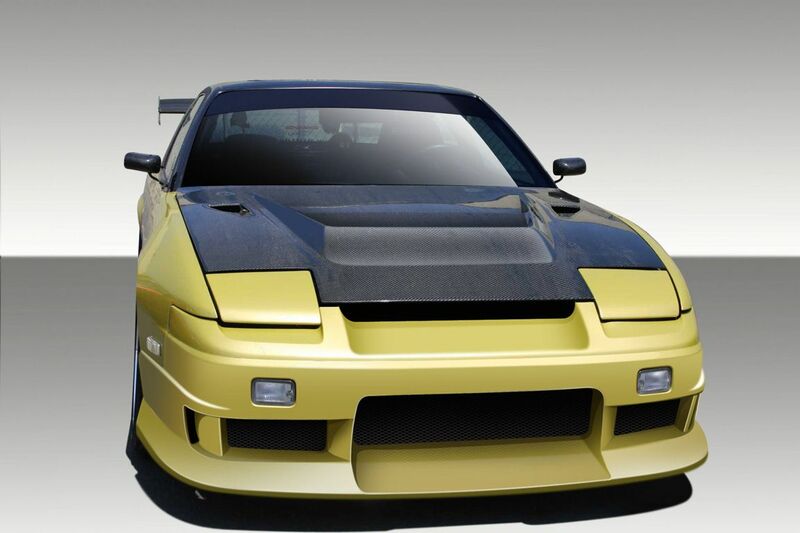 Our selection of Nissan 240SX S13 fenders offers you an array of custom styles to chose from. Many of our S13 fenders are 25mm-50mm wider than stock. The additional wheel clearance comes in handy when you are sliding sideways at full lock! For S14 models we also offer a wide selection of aftermarket fenders. One of the most common upgrades to the S14 when installing a body kit is replacing the fenders with custom styled versions with added vents or additional wheel clearance. We offer many styles to choose from so please let us know if you have any questions once you look through our catalog.